The 2015 season ended with a very chilly crew sail with much wind and some snow to really show us that the end of the sailing season was upon us. We've had a wonderful season of sailing, welcoming old friends joining us once again, and greeting new people looking to see what the Penobscot Bay sailing experience is all about. It's great to be able to show people our beautiful part of the world from a vantage point few get to see it from. For those of you who have joined us out in Penobscot Bay in the past, we thank you for your support and look forward to taking you out in the upcoming sailing seasons. There's no where we would rather be than our home in Camden Harbor and sailing in beautiful Penobscot Bay! We'll see you out there sailing! Please call 207-236-2323 or visit our website www.maineschooners.com to book today or to visit our online store! The Maine coastline sports some really beautiful lighthouses. We are very fortunate to have quite a few very close by our home harbor of Camden. On September 15, 2016 the Schooner Olad will celebrate Maine Lighthouse week with a full day sail that will include a tour of the Rockland Breakwater Lighthouse. We will depart from Camden Harbor at 10am and make our way down the coast towards Rockland. On the way we will see Curtis Island Lighthouse just outside of Camden Harbor as well as Indian Head Lighthouse in Rockport. Look for wildlife, lobster boats at work, and other sailboats as we take a relaxing sail. We will arrive and dock directly beside the Rockland Breakwater lighthouse…no need to make the mile long trek down the breakwater! A tour lead by one of the lighthouse experts of this historical site will follow. After the tour we will set our sails for Camden. Feel free to take some time at the helm or just relax and enjoy the nature and wildlife as the Olad sails on. Lunch, snacks, and soft beverages will be served to all on board. Reservations are recommended for this popular special sail. Please call 207-236-2323 or visit our website, www.maineschooners.com to book today. Great Summer Sailing aboard the Olad and Owl! It’s summer in Maine, and the weather couldn’t be more perfect. Warm days, cooler nights, and a consistent breeze to fill the sails…we couldn’t ask for better sailing conditions. The Schooner Olad and the Cutter Owl are in full swing and running 4 to 5 two hour sails daily. Two hours is the perfect amount of time to get out in Penobscot Bay and relax while we cruise around and see the sights. The wildlife has been out in force. Seals and porpoise are a daily sighting, and there are many different types of birds to see. Borrow a pair of our binoculars that we keep on board or bring your own for a closer look. This year we are pleased to announce that we have added an online store in addition to our little shop on the public landing, and we have many of our items now online. Many styles of our t-shirts are available, mugs and hats as well. You can even order gift certificates for that special someone’s birthday or for the holidays. We’ve just expanded our t-shirt selection to include some classic polos as well as some funkier Maine sailing tees. We have lovely Schooner-themed bags, jewelry, home décor, and framed prints of the local area and of course, the Olad! Come check us out at the shop off of the public landing or at our online store. For more information and reservations, please go to our website www.maineschooners.com or call us at (207)-236-2323. Great Schooner Race aboard the Olad! 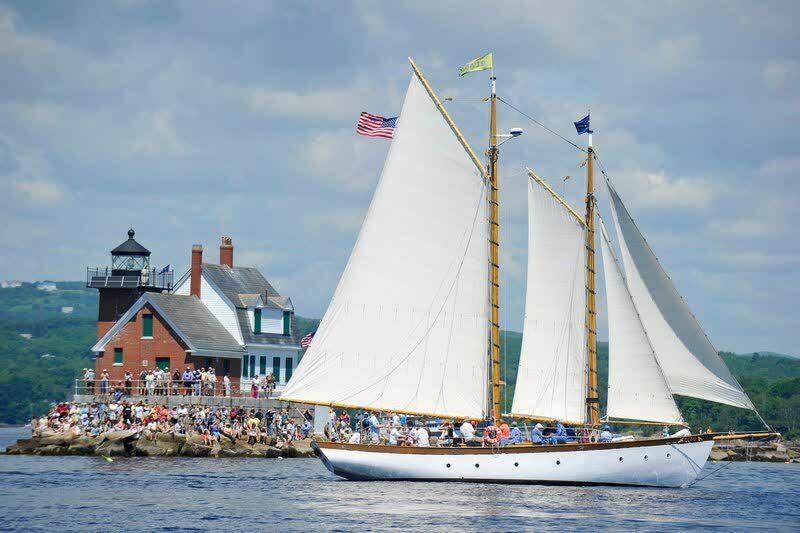 Join the Schooner Olad in Camden, Maine as we participate once again in the largest gathering of tall ships in North America. This year marks the 37th anniversary of the Great Schooner Race in Penobscot Bay. More than two dozen tall ships will vie for the win as they race to the finish line. Guests will have the chance to help us sail as we endeavour to beat the competition for 1st prize. This exciting sail is an all day event with lunch, snacks, and beverages being served. Don’t miss the fun and excitement of this competitive and memorable event! Reservations are highly recommended as this is a very popular full day sail. Please call 207-236-2323 or visit our website www.maineschooners.com for reservations today. Celebrate Father's Day with Dad aboard the Schooner Olad!